At the Museum of Jewish Heritage’s ‘New Dimensions in Testimony’ gallery. Photo by John Halpern. “Hi, Pinchas, nice to meet you,” I begin, standing in front of a microphone and holding down the button on the mouse to talk. I release it to hear a response. “What does it mean to you to be called a survivor?” I ask. “To be a survivor is to be a privileged person,” he says, smiling slightly. “Sometimes it’s to be a tormented person; sometimes it’s a lucky person. Sometimes you think, ‘Why am I different than anybody else?’ So you try to forget.” His eloquence gives me goosebumps. As a former interviewer for the Shoah Foundation, I recalled the emotionally draining preparation and aftermath of every interview. 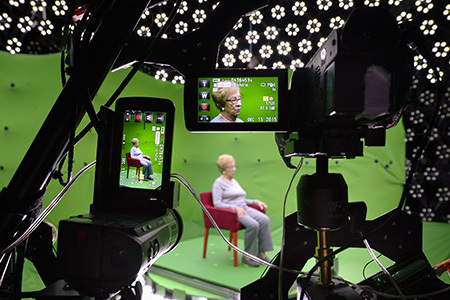 I wasn’t sure what to expect from the virtual conversation with the recorded image of a survivor that is at the heart of “New Dimensions in Testimony,” developed by the USC Shoah Foundation in collaboration with the USC Institute for Creative Technologies. Despite the distractions of being in a public space, I found the experience touching. I was even emboldened to pose questions I might otherwise have hesitated to ask. The exhibit opened on September 6 and runs through December 22, 2017 at the downtown Manhattan museum. 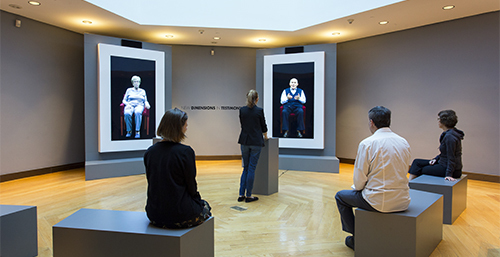 As the technology allows the exhibit to run in multiple locations as the same time, it is also being installed permanently at the Illinois Holocaust Museum and Education Center in Chicago on October 29, in the museum’s Take a Stand Center, where, for the first time, the holographic installation will have a more three-dimensional feel. Museum visitors will typically participate in moderated sessions with a docent and also have the opportunity to ask their own questions. The testimony will be available as a resource to other museums and learning institutions. The exhibit is also a vivid experiment in language: The key element is the system’s ability to transcribe and analyze questions and find the most appropriate response. Whether visitors ask, “Where were you born?” or “Do you believe in God?” data is captured and processed into video segments that can be played back verbatim. “We made a conscious choice not to manipulate voices or responses,” Smith stresses. Gutter, 85, a Toronto resident and honorary cantor at the Kiever Shul, was the first of 12 survivors to be trained and interviewed especially for this project. He answered hundreds of questions in a variety of iterations over the course of 5 days, captured by 52 cameras arranged in an arc. Gutter has 30,000 different versions of questions in his database and over 1,900 responses. Recording Eva Schloss at the USC Shoah Foundation. “Five-minute summary,” I speak into the microphone, and he packs the details of his life into a concise retelling. He and his family fled Lodz for Warsaw and were transported to Majdanek when he was 11. His parents and twin sister Sabina perished there; he survived four camps and was liberated at Terezin. “Every time I talk, and every time you listen to me, you get a little piece of me which is now embedded in you,” he says. A survivor of Auschwitz-Birkenau, Schloss, 88, a London resident, is the posthumous stepsister of Anne Frank. The exhibit marks her pilot testimony in “New Dimensions of Testimony.” Schloss didn’t know Anne well as a child, but after the war, her mother married Otto Frank, Anne’s father. Her databank has far fewer versions of questions and answers—about 12,000 questions and 1,250 responses—so the interaction with her is often frustrating. “Would Anne be happy that her diary was published?” is met with a recounting of Otto’s decisions in publishing the diary. “What do you think your responsibility is as a survivor?” “I don’t think so, no,” she answers. Those missed opportunities are in fact part of tweaking the technology: The technology becomes more precise the more questions it fields.